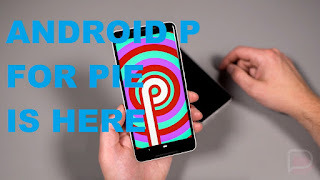 The latest android version has Android pie has been launched by Google. currently Android P stands for pie is launched only for Google pixels smartphones but smartphones for other manufacturers will also get the update soon. Android p will increase your smartphone's battery life by well optimization of apps. Android p is smart enough to decide which apps you use the most and ignores the ones you rarely uses. This new Android Pie feature allows you to edit or view screenshot right after taking it. This feature was in demand since long time. Just like Apple Iphone X, the new Android P will give you the modern geture navigation. That is right, now you can swipe up to go to home screen and swipe right to go to application manager. The new Android P will show you the preview of images in message notification from any messaging app like whats app and Facebook. Selected Text will be magnified. Now wherever you select a text, it will be magnified for better viewing. Auto screen rotate gets better. Now the screen will rotate as you move it, you don't have to wait for screen to rate after rotating the phones which was a problem in previous android version. Now with the new gesture navigation on Android P, media control option becomes improved and easy. Android P is designed to give full support to the latest smartphone trend that is notch. Now days notch is the new necessity for the smartphones, As trend set by the Iphone X now Samsung, honor xiaomi all leading smartphones is following. So these were some latest features which you will get in Android P. Android is successor to Android Oreo released on 6 August 2018.